Simple tool to keep your inventory, bank, and guild bank nice and tidy. Various sorting methods available from simply moving items to fill empty slots, alphabetical order, to following the list of types on the auction house. 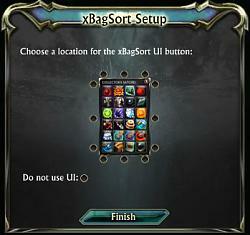 To setup simply choose where you want the xBagSort button to be for your inventory and/or bank. Click to expand it and get your bags in order! Left-click the XBS button to expand the menu and configure sorting options. Right-click the XBS button to sort based on the last used sorting options. /xbs ui - enables inventory sorting interface. /xbs setup - brings up the intial UI location selection window. /xbs quantity - Sort inventory based on number of items in a stack. "/xbs name bank" or "/xbs bank name"
This works for all sorting types. "/xbs name bv2" or "/xbs bv5 name"
"/xbs name guild1" or "/xbs guild5 name"
To ignore a bag from sorting, add "ignore#" for each bag where # is the number of the bag. "ignore1 ignore3 ignore4" would ignore bags 1, 3 and 4. This works for both inventory and bank sorting. "invert" or "-i" will reverse the sorting order (Z-A). "rear" or "-r" will place empty slots before items. 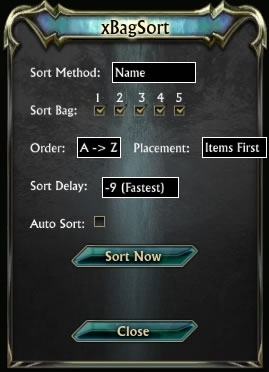 Appending "autosort" or "auto" will enable auto-sorting for inventory bags. 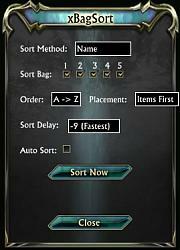 Auto-sorting works for all current sorting methods and occurs when bags are opened. Condense sorting should no longer sort slowly. Updated "auction house" sorting order. "Item move failed" should no longer appear constantly while sorting. "Sorting in progress" messages in chat now shows the total of items to move ("Sorting in Progress: 50 of 100 items moved"). Fixed an error when sorting bank vaults. Bank sorting with "empty first" placement should no longer cause an error. Condense sort method combined with "empty first" placement will no longer cause items to keep reversing order. Fixed main bank vault not sorting unless all vaults are selected. Bag ignoring slash commands changed from "ignore#" to "ignore##" where ## = 01, 02, 03, etc. rather than just 1, 2, 3. UI Added for bank vault sorting (this may be horribly broken, I do not have any extra vaults to actually test this). Bank lock button will now persist between sessions. Sorting should now be faster overall. Moving items during sorting or adding additional items to bag/bank will no longer cause 'Code 1' errors and will continue to sort with additional items taken into account. Fixed error when right-clicking XBS bank button. Added basic functionality for sorting bank vaults. Inventory sorting when auto sort is disabled should no longer cause a run-time error. Sorting by rarity should now take transcendent rarity items into account. Note to self: Don't change addon description and break the addon before uploading. Right-clicking the XBS button on inventory or bank windows will now sort them based on last used settings. Inventory bags should no longer occasionally not sort when being opened. Bank auto sort will auto sort inventory bags first (if inventory auto sorting is also enabled). Opening the bank will no longer cause inventory bags to be sorted with bank auto sort options. Collectibles should sort to the proper position with auction house style sorting. Improvements to sorting functions which should result in faster sorting. Various items had a talking to. They will now go to their proper places when using "Auction house" sorting. Bank bags 6, 7, 8, 9 check boxes will no longer apply to bag 5. Inventory auto sort check box will no longer show as unchecked at loading if bank auto sorting is disabled. Text for "Sort Delay" is now "Sort Speed". (Cosmetic change). Initial setup for new characters should no longer appear twice. "Auction House" sorting should work properly again. Addon should once again work! Added Support for inventory bag slots 6 & 7. Updated Auction house order sorting to include new categories. "Sort Completed" should no longer appear while using auto sort. Note: Additional bank vaults not officially supported (read: Author currently only has one bank vault and can't test it). Bank auto sort setting should no longer sort inventory bags. Setup window will popup again after installing this version. Added additional sorting method (Quantity). Fixed text and button alignment issues. "Lock" button should now properly show as unlocked after manually pressing the XBS button. Notice on Performance watchdog: This addon does use a fair amount of resources while sorting. It is recommended to either increase sort delay, or ignore performance notices for this addon. Various inventory UI features and improvements. Inventory UI is no longer locked below/left of your inventory. New user setup: You will be prompted where to place the UI the first time you use xBagSort. You can now lock the sorting UI and it will be open when you open your inventory. Various fixes to prevent conflicts with other addons. UI button will no longer be visible without inventory being open. Guild vault 2-5 sorting should again work properly. "/xbs ui" will now correctly disable the ui. Added documentation to inventory UI. Added help button to inventory UI. New close button for inventory UI. Inventory UI no longer extends outside the UI window. Guild bank sorting no longer requires items in the first 2 vault slots to check for vault permissions. Guild bank sorting will no longer toggle UI settings. User interface added for inventory sorting. "/xbs ui" will enable the new UI. 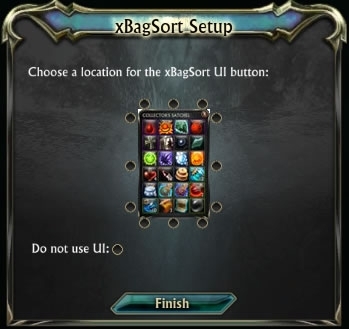 Clicking the "XBS" button below the first inventory bag will bring up the sorting UI. Auto sort options will no longer persist between sessions after being turned off. Various event items without a type will now be sorted last. Fixed an issue that could cause sorting to stop prematurely while reporting it was completed. Auction house ordered sorting added. "/xbs ah" will sort following the category order in the AH list. Stacks of items will now sort lowest->highest as to always use the smallest stack first. Guild bank sorting should once again work correctly. Auto-Sorting implemented for inventory bags. Appending "autosort" or "auto" will cause bags to sort automatically when opened. Auto-sorting works for all available inventory sorting commands. Appending "show" will display the current method being used by auto-sorting. Appending "off" will disable auto-sorting. Appending "invert" or "-i" will cause the sorting to reverse order (Z-A). Appending "rear" or "-r" will put empty slots before items. Sorting will now begin immediately rather than having a delay before the first iteration. Bag ignoring implemented for inventory and bank sorting. Appending "ignore#" where # is the number of the bag you do not want sorted will not sort that bag. "/xbs type ignore2 ignore3 ignore4" will sort inventory bags 1 and 5 only. Command list is no longer displayed in the chat window, "/xbs help" will bring up a formatted list of commands. Empty backpack slots or bank slots will no longer cause errors if you own them but do not have an actual bag in them. Multiple stacks of the same item should sort properly rather than get stuck. Don't forget! Bags need love too, don't ignore them too much! Appending "throttle" to a command will enable an extra verification step to confirm a sorting iteration is completed. Appending "-#" where # is 1-9 will speed up sorting iterations by 1-9 tenths of a second. Appending "+#" where # is 1-9 will slow down sorting iterations by 1-9 tenths of a second. Sorting iterations will adjust themselves slightly if the game is unable to keep up with the sorting. Guild bank sorting should no longer lock up the client. Additional throttling and limiting changes. The number of items sorted per iteration has been capped at 75. Rarity should once again sort correctly. Additional throttling added when handling large numbers of items to prevent infinite looping. "debug" command added (for debugging purposes when necessary). Guild bank sorting and throttle modifier implemented. Guild bank sorting checks permissions prior to sorting and should not be counting against daily limits. Appending "-#" where # is 1-9 will cause the throttling to decrease by 1-9 tenths of a second. Speeds above -5 are not recommended. Some unused code removed from files. Sorting should now take fewer iterations to complete. Added /xbs abort to break out of sorting. Sorting will automatically abort if to many iterations occur. Added additional sorting methods (Name, type and rarity). Sorting now takes place using an update hook rather than trying to process all at once. Fixed an issue where condensing would occasionally leave the last slot in a bag empty. the addon has some weird tendency to drop the auto-sort setting. no idea when and how it happens, i just notice that sometimes, when logging into a character (of which i have only 4), the checkbox will be off. incidentally, used to be, the sorting speed could have a similar "instability", but that seems to have gone away. oh and also that "could not be moved" on-screen message is still annoying. Thanks, this should be fixed in 13.2 which was just uploaded. Last edited by Xioden : 12-29-13 at 08:34 PM. so is anyone working on a fix for this ? Re: Re: Re: This still being worked on? Just as the subject says... this is much better than the Trion implementation. It's sort of still being worked on. Some real life issues crept up and I had to cancel my subscription. I believe I can use below 20 characters with the trial thing though. I believe the new watchdog/cpu error thing is causing people problems. - I never finished the bank or guild bank UI. - Toggle for stacking items (two stacks of 5 become one stack of 10). - Sort by quantity of the items. Assuming when I am actually able to log in later xbs hasn't imploded I'll try to get an update out today. upon open/close? ...Was that left in by accident when testing? I removed the print commands and all seems to be good now. Wasnt a big deal, just a little annoying when I would constantly close/reopen bags. Yep just some extra testing stuff from not saving after removing them since it was fine on my end but not the uploaded files. 10.1 Fixes it, as well as bank auto sorting causing inventory bags to auto sort. Last edited by Xioden : 08-21-12 at 04:33 PM. Re: Re: This still being worked on? Re: This still being worked on? What happened to 'auto' mode? It no longer functions as of a release or two ago, here. It used to sort on opening the bags when enabled, no longer does. If you are using any other addon that also hooks the bag open event only one will function. Notably Imhothar's Bags, although there may be others at this point. I get the same conflict, I think. However, Imhothar's Bags doesn't spit out errors for me at all. What I do get is, when xBagSort and Imhothar's Bags are both enabled and usable in game, the xBagSort UI (and non-UI auto sorting) doesn't work at all, even the little green tab doesn't show up on the side of the first bag like I set it to, it's no where. That's the problem I experience. I don't know if that's the same one or not. Can you elaborate on what problem you're having? I don't see any immediate conflicts, but Imhothar's Bags is throwing out a number of errors even when it's the only addon running. This is an issue with the way UI events are handled. Until there is a change to the API there isn't anything either of us can do and the two addons will not be compatible with each other.